The 28-year-old police officer, Samuel Jimenez, was a married father who had only recently become a full-fledged member of the force following the standard 1.5-year probation. Neither the police nor the Cook County Medical Examiner’s office immediately released the names of the other victims. 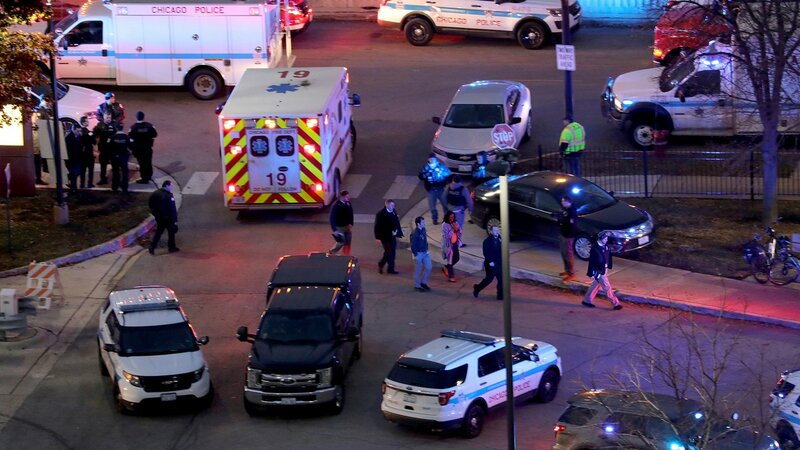 “The city of Chicago lost a doctor, pharmaceutical assistant and a police officer. All going about their day. All doing what they love,” Chicago Mayor Rahm Emanuel said during Monday’s press briefing. Johnson said the gunman, who police did not identify, got into a verbal altercation around 3:30 p.m. outside the hospital with a woman – a Mercy hospital doctor – with whom he was in a domestic relationship. After a friend tried to intervene, the man lifted up his shirt to reveal a handgun. After the friend ran inside, the gunman shot and killed the doctor. According to media reports, he shot her several times before standing over her body and shooting some more. Police rushed to the scene, and the gunman shot at their squad cars before rushing inside the hospital where a shoot-out continued as medical staff, patients and visitors took cover and tried their best to hide, Johnson said. The gunman fired his gun indiscriminately, Johnson said, shooting and killing a physician’s assistant who’d just gotten off an elevator. She “had nothing to do with nothing,” Johnson said. Sometime in that timeframe, the gunman also shot and killed Jimenez. It’s not clear whether the suspected gunman shot himself or was killed by police. A witness described watching events unfold from an emergency room window, beginning with the incident outside the hospital. The hospital was kept on lockdown during and immediately following the incident, as police carried out a “methodical” search. Jimenez was taken to the University of Chicago trauma center. At 7:30 p.m., CPD spokesman Anthony Guglielmi tweeted word of Jimenez’s death. Johnson, Graham and Emanuel spent time with Jimenez’s wife, mother and mother-in-law before speaking with the press. Emanuel said it was a day of highs and lows for the CPD. Monday morning he and Johnson had congratulated 363 officers who had just joined the force or received promotions. After the briefing, a police procession followed an ambulance taking Jimenez’s body to the medical examiner’s office.